Different types of cellulose membrane filters used in pharmaceutical industries in microbial analysis and water systems. 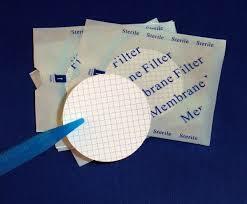 Membrane filters are thin polymer films those have many microscopic pores. These filters have different pores sizes and used for different purposes accordingly. Membrane filters are used in various pharmaceutical activities. Cellulose filters are most commonly used filters in microbial analysis and reverse osmosis water systems. Most of the cellulose membrane filters are hydrophobic in nature. Cellulose membrane filters are made of different cellulose molecules. But following two types of cellulose filters are used in pharmaceutical industries. Cellulose nitrate membrane filters (also known as nitrocellulose membrane filters) are prepared by the reaction of cellulose and nitric acid. Each glucose molecule in cellulose nitrate polymer is esterified with three nitrate groups. Nitrocellulose membranes are prepared by dissolving this nitrocellulose in organic solvents. This solution of cellulose nitrate in the organic solvent is spread on a smooth surface to form a thin membrane. The pore size of the membranes depends upon the evaporation rate of the solvent used to prepare the cellulose nitrate solution. These filters are widely used in molecular biology for filtration of proteins and peptides. Careful handling of cellulose nitrate filters is required because the solutions containing organic solvents can damage the membrane filters. Solutions containing acetone can dissolve the nitrocellulose filters. These cellulose membrane filters are used in sterility test of sterile pharmaceutical products and microbial analysis of purified water and water for injection. Cellulose acetate filters are made of a mixture of cellulose diacetate and triacetate. These cellulose membrane filters are hydrophilic in nature. Cellulose acetate filters are prepared by a solution of cellulose acetate, acetone and polyethylene glycol (PEG). The pore size of the cellulose acetate membrane depends upon the concentration of polyethylene glycol. Higher concentration of PEG results in larger pore size of the membrane filter. These filters have 66 to 78 % porosity. These filters can be sterilized by autoclaving for microbiological analysis. Generally, filters having pore sizes of 0.22µ and 0.45µ are used in pharmaceutical industries. These cellulose filters are used in reverse osmosis membranes and ultrafiltration membranes. These membranes are biodegradable so it is required to have chlorine residue to prevent microbial damage.